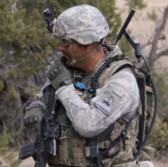 The Defense Department has asked industry to submit proposals for a three-phase contract that aims to research and develop wearable antenna systems for integration with soldiers’ multi-frequency band radios. DoD issued the solicitation for the Multi-Band Body Wearable Antenna initiative as part of the Small Business Administration’s Small Business Innovation Research program, according to a notice posted Dec. 10 on the SBIR website. The Pentagon wants the new wearable antenna platforms to function across six radio frequency bands and provide voice and data communications in various modulation methods. Phase one of the program will focus on the demonstration of a communications link for the antenna design. The second phase will deal with the development a ruggedized, lightweight antenna platform, while the final phase will assess whether new antenna designs could replace radio antennas that uniformed personnel currently use. DoD will accept applications for the program through Feb. 17.